The easiest way to get a TV channel on the air. Reliable, affordable, efficient, and future-proof broadcast playback. Enjoy the benefits of an all-digital workflow with flexible expansion and integration options. Integrate with other TelVue services to stream to the Web, add signage, and more. 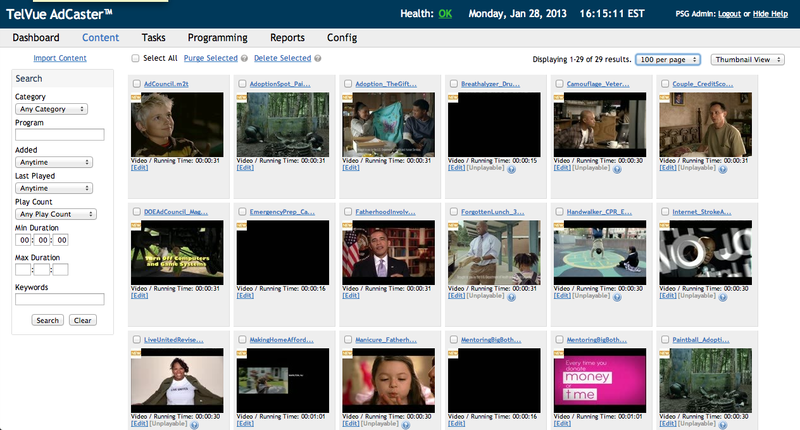 TelVue’s scheduling tools make running a TV channel a snap! Drag a thumbnail into the schedule; Preview and trim a video right in the interface; Advanced search options for simpler content management. The ideal PEG broadcast server. Expand your programming possibilities by capturing live incoming streams for future replay. Great for recording sports, meetings, and other live events for your programming library. Broadcast real-time 24×7 information on your TV channel with TelVue InfoVue, a professional-quality, web-accessible HD digital signage solution. Engage your audience with up-to-date weather, traffic, news, community, and other dynamic information, as well as stunning, high-definition video clips and images. Set up TelVue InfoVue as a continuity stream for your HyperCaster, and your channel will always be broadcasting information your community wants. The TelVue Audio Loudness Processing option includes out-of-the-box presets for broadcast and Internet streaming, including the CALM audio broadcast industry standard. Built upon the real-time audio technology of Linear Acoustic™, the industry leader in audio processing for professional broadcast, the HyperCaster & ProVue Audio Loudness Processor plugin eliminates the need for expensive external audio processing equipment. Looking for ultimate playback flexibility in a single, powerful, PEG broadcast server? Each SDI port can be configured as an input or output for multiple channels of Playback & Encoding, plus native Switching All-In-One! The HyperCaster AIO Series is well-suited for PEG and other SDI operations who want an all-digital workflow with configurable input and output. Ideal for the PEG station that wants flexibility in configuring IP or SDI input/output options. Up to 12 configurable SDI ports and 5 playback/encode channels, RAID, redundant power. Media 11.5TB, 8 Drive RAID 6 standard. Up to 32 TB for B2000-8 and B2000-12 models. Media 5.5TB, RAID 5 for B2000-4 model. System Health Notifications SNMP, Email, REST API, and Web Browser UI. External Reference Blackburst in SD, 720p50, 720p59.94, 1080i50 and 1080i59.94 formats or Tri-Sync in any HD format. Other NICs Option for Dual Fiber 10/100/1000 BT in lieu of 2x Copper. Designed for single-channel operations that want the best of both IP and SDI workflows. 4 configurable SDI ports, 1 playback + 1 encode channel. TelVue’s flagship SD/HD/4K playback server programs up to 20 channels. With flexible content storage, enhanced scheduling features, in-browser previews and optional downstream graphics, the TelVue HyperCaster brings you all the advantages of the IP workflow in a single, highly efficient server. Broadcast up to 20 HD or SD high-quality digital video TV channels with the TelVue HyperCaster B1000 IP Broadcast Server. Comes with RAID and redundant power. 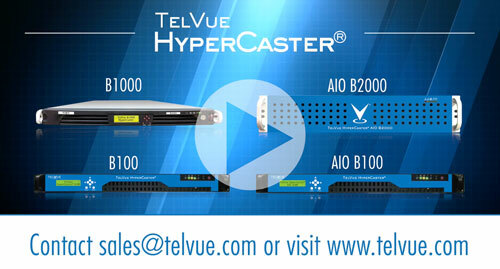 Broadcast up to 4 HD or SD high-quality digital video TV channels with the TelVue HyperCaster B100 IP Broadcast Server. 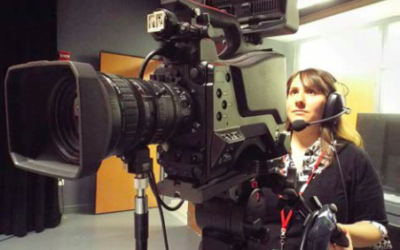 Optional integrated ProVue decoder would add SDI-out and integrated graphics. More information on how the HyperCaster is deployed in the field. Government Video's latest issue features the Longmeadow TV (Massachusetts) HD upgrade, using the TelVue HyperCaster system: http://www.nxtbook.com/nxtbooks/newbay/gv_20150708/index.php#/18 Go Longmeadow TV! All the features of a HyperCaster, in the cloud.